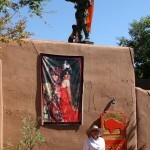 Claudia Toutain-Dorbec is a multi-media artist living in northern New Mexico. 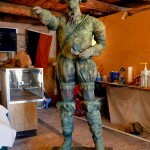 The Downey Gallery in Santa Fe asked Claudia to create a life-size sculpture in preparation for the city’s 400th birthday celebration which began Labor Day weekend 2009, and runs for a year. She created the Artistador, a conquistador who is also an artist, seeking his treasure in art. He stands with his arm extended pointing at his treasure, with brushes in hand, and a palette at his feet. The sculpture, displayed on the Downey Gallery’s roof, had to be lightweight, but strong enough to withstand high winds and all kinds of severe weather. The basic body form was created with wire, plastic, Styrofoam™ and other materials bonded with 105 Epoxy Resin® and 207 Special Clear Hardener®. Because epoxy does not dissolve foam it is ideal for this kind of bonding. Claudia used heavy gauge canvas, various found objects, and created molds for the armor, which were poured and applied. 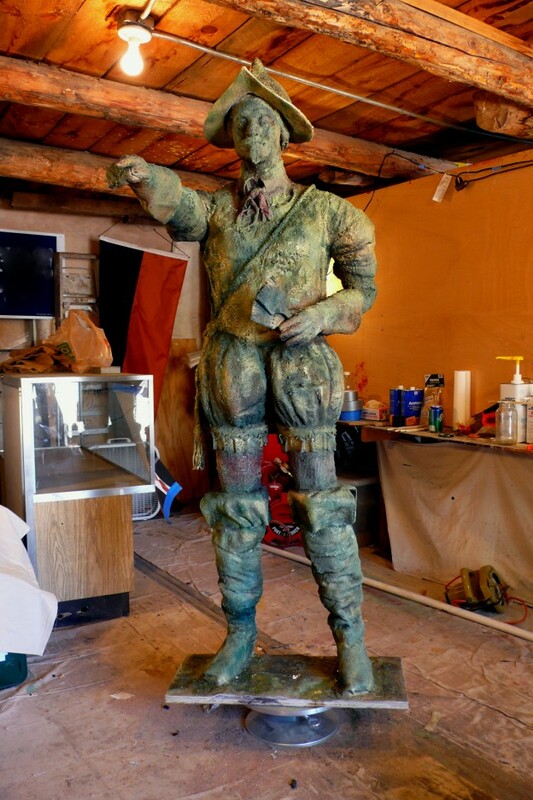 Three more layers consisting of hundreds and hundreds of small cut pieces of thick and thin fiberglass fabric were applied with epoxy, much the same way paper mache is applied. Texture was applied using various grades of sand, dirt, pigments and gravel. It was sealed, then received 3 to 4 coats of antique patina. To protect the resin from UV exposure, a heavy coat of exterior urethane completed the process. For more information visit Claudia Toutain-Dorbec. The life-sized Artistador under near completion in the studio. The artist applying the finishing touches to the sculpture’s patina. The Artistador on display on the roof of the Downey Gallery in Santa Fe, New Mexico. This entry was posted in Arts & Crafts and tagged 30, art, Artistador, Claudia Toutain-Dorbec, Epoxyworks #30, Santa Fe, sculpture, Spring 2010 on April 18, 2015 by ewadmin.